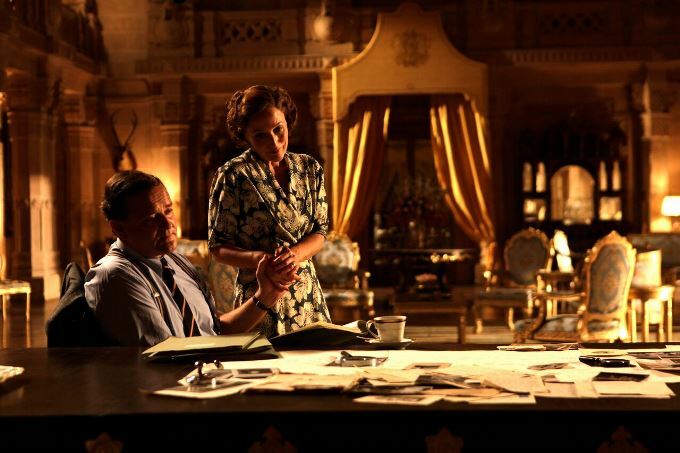 Chadha's lavish period drama claims that Britain’s wartime prime minister Winston Churchill plotted to split up India, and Mountbatten was a pawn. Master storyteller Gurinder Chadha, 57, has waited a long time to tell a searing personal story. Just before the end credits in Viceroy's House, we learn that this British Indian director's grandmother was a refugee whose baby girl starved to death when the family fled Pakistan after partition. Moviegoers may best know Chadha for comedies like Bend It Like Beckham and Bride and Prejudice, but Chadha has wanted for the longest time to explore the grim impact of partition and tell her family's story. The rush to split India into Hindu India and Muslim Pakistan on August 15, 1947, left millions stranded on the wrong side of the new border. Nearly 14 million Hindu, Sikh, and Muslim refugees fled their homes as entire villages were butchered. One million died. Sadly, 70 years later, India and Pakistan are still struggling over the Kashmir tangle. "My uncles and aunts were only small children when they were forced to flee. My father’s youngest sister never made it—she starved to death," Chadha told Khabar. Chadha said that she hopes her film will inspire viewers to look beyond the established views about why partition happened. “I was very happy that I was able to take on the British Empire version of history," says Chadha, who has relied on Narendra Singh Sarila's revelatory book The Shadow of the Great Game—which highlights the role of British strategic interests in the region—to show a different view of what happened. In most historical accounts, Lord Louis Mountbatten, who was sent to India to hand back power, stands vilified for the Mountbatten Plan which led to partition with all its bloodcurdling horrors. It appears that Prince Charles, who had a notably close relationship with his great-uncle Mountbatten, helped shape Chadha's script by pointing her to Sarila's book which lays the blame of partition at the feet of Britain's wartime prime minister Winston Churchill. Taking her lead from Sarila’s book, Chadha's film casts Churchill as the secretive architect of this havoc, opportunistically fostering Pakistan as a strategic counterbalance to a left-leaning India. 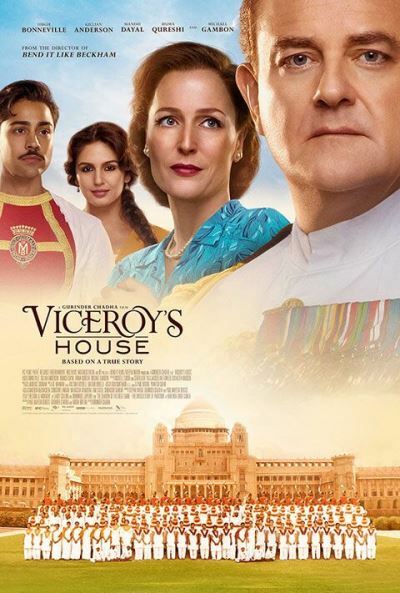 Viceroy’s House, starring Hugh Bonneville, Gillian Anderson, Huma Qureshi, Tanveer Ghani, Manish Dayal and Denzil Smith, claims that the British government wanted to carve up India to keep influence over the key port of Karachi in Pakistan and to stop the Soviet Union expanding across Asia. A scheming Churchill had secret talks with Pakistan’s first Governor-General Muhammad Ali Jinnah long before partition, which supports that theory. The film’s clear premise is that when it comes to Britain’s share of the blame for the bloodshed of 1947, Churchill, not Mountbatten, is the culprit. Chadha's attempt to rewrite the established version of history has met strident criticism from certain quarters. 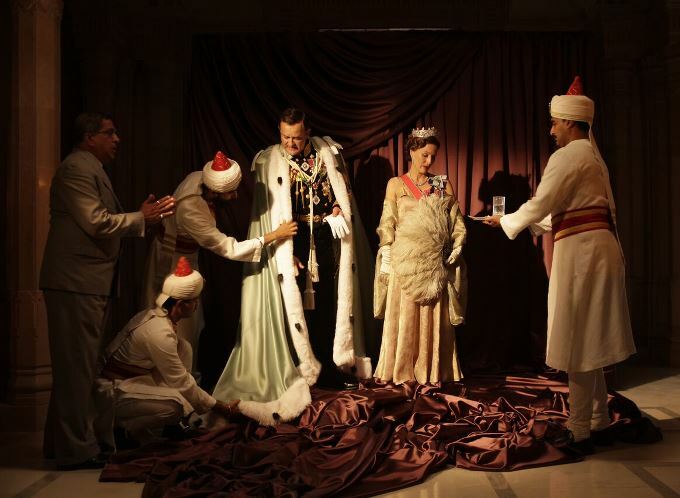 "This Downton-in-Delhi tale takes breathtaking liberties with real-life horrors—and misreads the roles of Churchill and Mountbatten," writes British author Ian Jack in The Guardian. Pakistani writer Fatima Bhutto also accused the film’s British-Indian director of seeming “to take pleasure in laying the bloodshed and brutality of 1947" at the feet of Jinnah and Churchill, not Mountbatten or the Hindus. Vexing politics aside, the opening scenes of Viceroy’s House have all the elegant hallmarks of Downton Abbey, only set in Delhi. Anderson plays the role of Edwina with arresting charm and declares that her grand new home in India “makes Buckingham Palace look like a bungalow.” That should tell you something about the gorgeous sets. Chadha sat down for an interview with Khabar magazine on her making of this personal-political drama. How does Viceroy's House challenge the history that we've been taught? Growing up in London, I was taught at school that Mountbatten came to India to hand the country back, but the Muslims wanted their separate state and we Indians started rioting. There was so much violence that Mountbatten had no choice but to divide the country, so partition was our fault. That's the history that I had been taught, and most people felt that was why partition happened. I wanted to challenge that through Narendra Singh Sarila's revelatory book The Shadow of the Great Game. Narendra had been aide-de-camp to Mountbatten [as a young man] and had served in the Indian Foreign Service later [1948–85]. In 1997, he was in the British Library researching a book about his family when he was approached by an Indian librarian. She had been given a box of papers to index, secret British government documents that had been declassified. Through painstaking research, Narendra saw that the documents appeared to confirm a secret strategy for the protection of British interests in Asia that inexorably led to partition. So much for it being the fault of the warring Indians, as I had been taught at school in London, or principally the fault of Mountbatten, as many believed. It was far more complex, and Sarila's book provided me with a way into the story. There had actually been a secret plan drawn up years earlier by the British that recommended breaking off parts of India. After the Second World War, Britain had promised to hand India back political power, but it was very nervous about doing this because India was incredibly vital in terms of its strategic military and political position in Asia, given rapid Soviet expansionism. Churchill worried that if he handed India back intact as promised they were handing the whole of Asia to the Soviet Union. In Viceroy's House, a far more astute Edwina Mountbatten cautions her husband from rushing headlong to divide India. What I wanted to show is that Edwina was far more politically astute than her husband. Mountbatten was a kind sort of charming man, but he wasn't a politician. He was sent to India as the king’s cousin because the Indian people would respect that, but also precisely because he was not an astute politician. He was a naval officer who was used to following orders and not really questioning what he was doing. He was out of his depth. Mountbatten had the sort of upper class conceit, if you like, that he would be able to come and charm people because he wore his royal connections very high. He was a very vain man and I wanted to show how everything for him was about his uniforms, the pomp and splendor of being a royal member, more so than, in fact, the politics in many ways. However, once he did realize that he had been duped or made the perfect patsy, he felt very guilty, as did Edwina, which is why they stayed on after the British handover of India. You have a very sympathetic portrayal of the Mountbattens. If you look at the archival footage, most vicereines just stayed in the house, but all the footage of Edwina shows her outside in refugee camps. She was a patron of the Red Cross and did a lot of hospital work as well. I was quite moved by that footage. I wanted to show also that we had blamed the Mountbattens—many people still blame them—but actually they were made fools of, like so many other people at that time. The film appears to be laying much of the blame for the bloodshed of partition on Britain’s wartime prime minister Winston Churchill. What I was trying to do was show the geopolitics of the time, and how everybody had an agenda, and how politicians were working to their particular agenda. Whatever you believe in, and wherever you are coming from, I wanted everybody to be aware this was what was at stake. If certain people had this information at that time as opposed to it being a top secret, documents for the eyes of only a very select few, things might have worked out very differently. I'm not saying there wouldn't have been partition, there wouldn't be Pakistan, I'm just saying there might be less carnage. Can you talk about how this has been a very personal project for you. I grew up under the shadow of partition because my ancestral homeland had become this new country called Pakistan. As a child in London I was aware that I didn’t have an ancestral homeland and also that my family had lost everything and had been refugees. I saw the lasting psychological scars of partition on my grandmother while growing up. She had lived through those events as a girl, and she had been traumatized by the things she had seen. If a villain came on TV she would become very agitated and say, “Turn it off!” We’d say, “It’s OK, Biji, we’re in England; it’s a soap opera from Birmingham.” So you know, I had a very traumatized grandmother growing up. It was not until 2006, when I was invited to be on the BBC show Who Do You Think You Are? that I had the chance to travel to the village outside of Jhelum, Pakistan, where my grandfather’s family once lived. When we eventually found the house, it had become home to several Muslim families. One woman handed me a shawl and a bouquet of bright plastic flowers, saying, “My family came from India in 1947. I am Indian like you.” Then an old Pakistani man smiled and said, “This is your home, please come back. We will be watching the road waiting for your return.” I burst into uncontrollable tears, tears held back over years of trying to contain the injustices of history to which my family had been subject, tears now released as I wept with the inhabitants of my ancestral homeland, now a different country, but one where we still shared the same Punjabi language and sense of family. It was at that moment that I vowed I would make a film that told the story of partition. As I researched the script, I also began to realize how little I really knew of the bigger picture, of the global interests at play as India was divided. Why did you feel the need to tell this story? How has the film been received in the three capitals, Delhi, Lahore, and London? It's been very well received in London, particularly by the Asian community, both British Pakistani and Indian. The overwhelming majority of people who watched the movie felt that they finally understood what was going on at the time. In Delhi, we had an interesting response where a lot of government ministers set up their own screening and came out incredibly moved. In Pakistan, sadly the film got banned. Why do you think the film was banned in Pakistan? When you are a young country, I think it's hard to feel that your country was born out of pain and suffering to so many people, including my family. I think there are people who don't want to deal with that. There have been plenty of NRI Pakistanis who have really appreciated the film and wept through it. 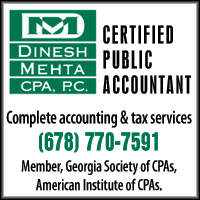 The movie gives a current context to the tensions between India and Pakistan as well. How does the film help the healing process? The film is very balanced and takes pains to show how the geopolitics of the time fed into partition. The film has great resonance for today as it is about what happens when people instigate hate against other groups. The end result of hate mongering is always violence and destruction. Viceroy's House is a film for ordinary emotional people, not politicos or cynics who want to hijack its message of tolerance and love. Opening in theaters and cable VOD September 1st, 2017. Starring: Gillian Anderson, Huma Qureshi, Michael Gambon, Hugh Bonneville, & Manish Dayal. In Gurinder Chadha’s lavish, sweeping historical epic, Hugh Bonneville (Downton Abbey) stars as Lord Mountbatten, the last Viceroy of India. 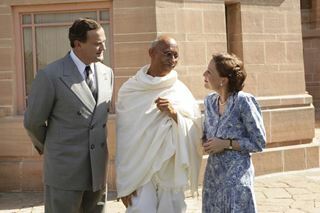 Arriving at Delhi’s palatial Viceroy’s House in 1947 to oversee handing the country back to its people, he and his wife (Gillian Anderson) negotiate with Hindu, Sikh, and Muslim leaders as conflict erupts and two independent nations are carved out of the subcontinent.